Bluff City Cemetery in Elgin, Illinois, has a a special section dedicated to veterans. Each year the city holds services on Memorial Day to remember those who gave their lives for our country. 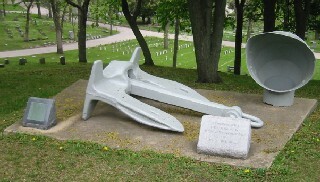 A huge white anchor lies on a concrete slab on top of a hill in the veterans' section. This anchor at Bluff City Cemetery came from U.S.S. Aaron Ward (DM-34), a destroyer minelayer hit by six kamikaze planes off Okinawa during the early evening of May 3, 1945. The ship somehow managed to stay afloat despite raging fires and extensive flooding, and another destroyer minelayer towed the stricken Aaron Ward through the night to safety at Kerama Retto. The kamikaze attacks killed 42 crewmen, including Laverne Schroeder of Elgin. Harry Schroeder, Laverne's father, heard after the war that the Navy had decided to scrap Aaron Ward due to extensive damage caused by kamikaze planes. He wanted something from the ship to remember his son, so the Navy agreed to sell him the 4,000-pound starboard anchor for $20. The anchor arrived in Elgin by rail on July 17, 1946. He initially placed the anchor against an elm tree on his farm outside Elgin, and he and his wife donated the anchor to the Navy Club of Elgin on Memorial Day of 1947. The anchor rested in front of the Navy Club on State Street until it closed in 1971, when the anchor was moved to its current location at Bluff City Cemetery. SEAMAN SECOND CLASS – U.S.N.R. The plaque on the right side states the anchor was relocated on Labor Day 1971 by the Elgin United Civic Association and the Elgin Trades Council. Lott, Arnold S. 1978. Brave Ship Brave Men. New York: Dale Books. Original edition, Indianapolis: Bobbs-Merrill, 1964.